These high quality Matte Matte Credit Card Laminating Pouches include a wonderful matte finish for an elegant soft look and feel. The matte finish provides a smooth writeable surface to photos, cards, and documents. These high quality pouches provide a transparent finish, enhance the colors of your documents and provide lasting protection. Can you write on and erase print on these with a dry erase marker? 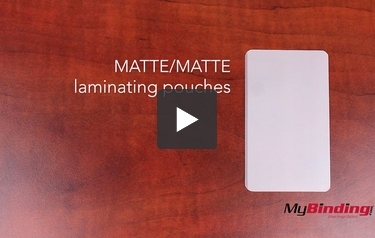 Matte Matte laminating pouches have a wonderful soft finish on both the front and the back of the pouch. This makes it possible to write on them with a normal ball point pen or even a pencil. However, the surface is more porous than standard glossy pouches and if you try to print on them with a dry erase marker you will NOT be able to wipe them clean. If you want to use a dry erase marker please consider our standard gloss pouches which will work a lot better for that application.